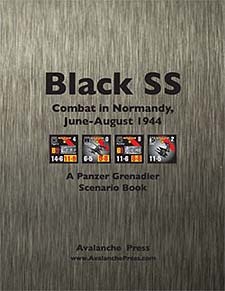 Black SS is a book supplement for the Panzer Grenadier series, with 35 new scenarios depicting the actions of Waffen SS divisions in the fierce fighting against American and British forces in the summer of 1944. There are also 165 new die-cut and mounted playing pieces depicting all of the SS playing pieces found in our Elsenborn Ridge, Road to Berlin and Beyond Normandy games with a black background requested by many fans. Black SS is not a complete product: ownership of 1940: The Fall of France, Elsenborn Ridge, Battle of the Bulge and Beyond Normandy is required to enjoy all of the scenarios.